For millennia, from Mexico to Montana, women have mounded up the earth and laid three specific seeds in the ground – all in the same square foot of soil. There are many stories of how the three seeds came to be, but they all share the understanding of these plants as women or sisters. Some stories tell of a long winter when the people were dropping from hunger. Three beautiful women came to their dwellings on a snowy night. One was a tall woman dressed all in yellow, with long flowing hair. The second wore green, and the third wore orange. The three came inside to shelter by the fire. Food was scarce but the visiting strangers were fed generously, sharing in the little that the people had left. In gratitude for their generosity, the three sisters revealed their true identities—corn, beans, and squash—and gave themselves to the people in a bundle of seeds so that they would never go hungry again. Together these plants— corn, beans, and squash—feed the people, feed the land, and feed our imaginations, telling us how we might live*. 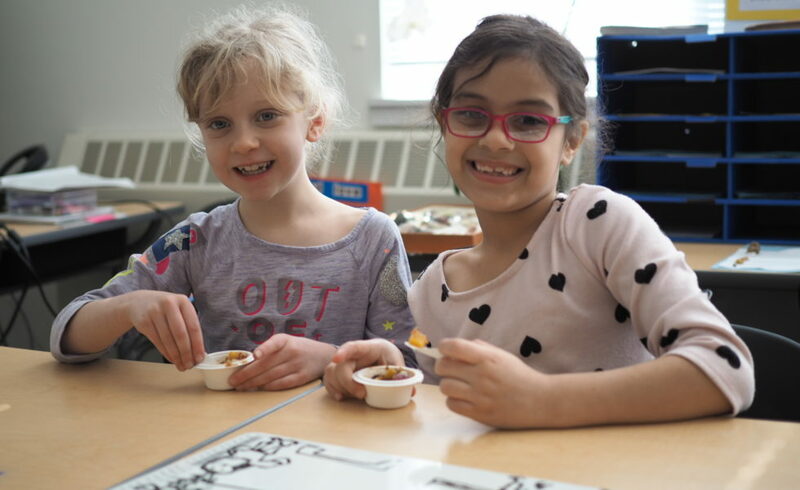 During Common Threads’ classroom cooking program, this colorful origin story was shared with elementary students as the aromas of Three Sisters Stew bubbled and filled the air. Garlic and onions met sweet squash in a tasty tomato sauce with beans. At this session, the last of four cooking sessions this school year, children gladly demonstrated their mincing and dicing expertise. The Three Sisters Stew brings together all that we have learned in cooking and gardening this year: The corn shoots up tall and fast, creating a pole for the beans to wind and climb, while the squat, bright squash lays at the foot of the other two sisters, protecting them from hungry insect mouths. Students chattered happily about the lessons that we learned from the Three Sisters. One student raised his hand to tell how the plants need each other, that they grow better together than they do alone. Across the room another hand shot up, and another student shared the importance of each vegetable’s unique gift. Understanding began to spread across various eager faces as the students realized what a classroom or community can become when individuals share their unique gifts with each other, just like the corn, beans, and squash, all will flourish and grow. After brainstorming and sharing, our mouthwatering stew was finally ready. “They are all here!” an eager and hungry fifth grader exclaimed after seeing the golden corn, hearty beans, and fragrant squash scattered in his cup. We raised our cups for the final time and thanked the sisters for providing us with all we need, filling our minds and filling our bellies.